Jet across the continents with style waring one of these beautifully crafted world-time watches. Whether you like all 24 time zones laid out on the dial or prefer to keep it simple, the globetrotter in you will surely be tempted by the latest, most stunning, and exclusive pieces, now available in stores. Available with a black or silver dial, this sporty but elegant world timer comes with a 43mm stainless steel case and features a COSC-certified chronometer. Equipped with an in-house automatic movement, the RM 63-02 features an oversize date and universal 24-hour and multiple time zone displays, all housed in a complex 200-part case made from grade-5 titanium. This piece presents an instant time-zone jump with a synchronised date function, and 24-hour and city indications on a guilloched silvered 18K gold dial beautifully complemented by a rose-gold case. Designed especially for the China market, this special edition of the LUC features Beijing, written in Chinese and in red, standing out against the satin-brushed dial, whose rich blue hue was achieved by galvanic treatment. Only eight pieces will be produced. Omega presents a sporty but luxurious world timer with the Seamaster Aqua Terra Worldtimer, featuring a case made in platinum, hands and minute indices in gold, and the world map painted in enamel on sapphire crystal. Only 57 pieces are available. Keep timekeeping clean and simple with Bulgari’s sleek Hora Domus watch, which identifies your home and destination cities in separate apertures. The watch also presents the seasons and time of day in discreet windows. It’s all housed in a beautiful rose-gold case. The GMT Earth is art on the wrist and features a 3D globe. On the back appear the 24 time zones with summer and winter times. Look to the lower right of this masterpiece and you’ll find Greubel Forsey’s stunning patented tourbillon. One of the most talked-about pieces at Baselworld this year was Patek Philippe’s world timer, which sounds its chimes at the local time rather than the home time. 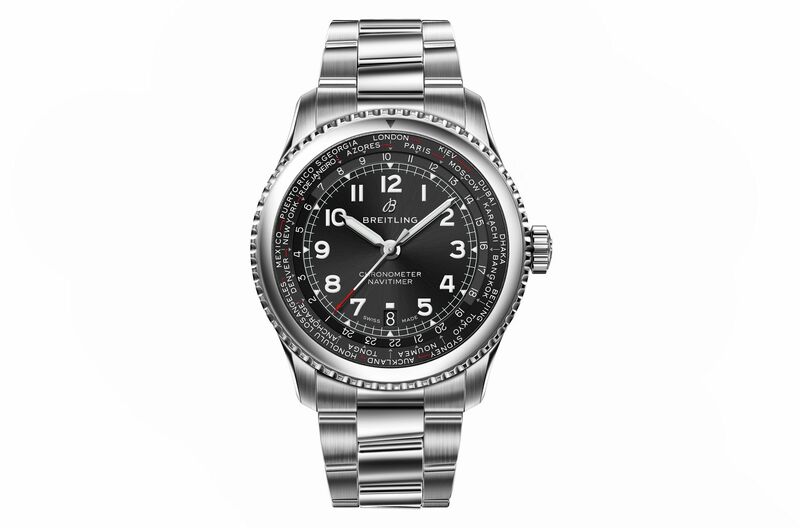 This ruggedly handsome piece allows the wearer to adjust the time zone through the bezel, with the hour hand, 24-hour display and date adjusting automatically.